This remarkable and innovative collection brings together 27 of Canada’s finest writers in celebration of 25 years of the acclaimed magazine Descant. Combining new poetry, fiction, non-fiction and drama, Paper Guitar offers a feast for the mind and the imagination. This book is a celebration of writers, and of text. Every piece of writing in this volume touches in some way on the process of creation, on its origins, on its motives, on its means. The idea of making is not an abstraction, but has a felt life. This book is a collection of Canadian writers, many of whom have come from elsewhere, some of whom have gone elsewhere to find their themes. Many have found that here is elsewhere, as exotic as another place. This book is a mapping of territory, the territory of the imagination, and the territory of the world, and the exciting, shifting border zone where they meet. As editor of the literary magazine Descant for more than two decades, I have worked with the twenty-seven writers in this collection. I asked each to fashion with me a volume which would celebrate art, art-making, the creative process. These are all writers in whom 1 believe profoundly. With humour and seriousness, together they have created an anthology which marks twenty-five years of the publication of Descant magazine. These fictions, these poems, these essays, these performance pieces, these texts, which are often combinations of many forms, will teach you much about the world, its shimmering sensuosity, its painful contradictions, its beauty spurs hovering just on the edge of focus. I’ve been thinking about the luxury of editing, of editing this book, and of the years I’ve given over to the editing of Descant. There’s an awful freedom about editing. In some ways, it’s the surgery of engagement with someone else’s Text flesh, the apparent dispassion of nipping and tucking. There’s an intimacy like love making, an entering into the flesh of the other. There’s the conversation between equals, in many ways the must ideal conversations which the text body of the author will experience. You could call it a kind of vice, though its intention is not to harm, but rather never to impinge on the freedom of the other. I’m attracted to writing which breaks out of its boundaries, its received conventions, which moves outside the limits with which we feel we must live, perhaps for convenience, and perhaps for surety. I am attracted to writing which not only takes us with it, but which stretches us towards it. A magazine like Descant is a record of sensibilities. Separate voices come together under a shelter, the roof of the book. This has been raised by the producers of the book, the craftsmen who design, who edit, who print. All have a hand in the making of the text. You can see the individual markings, the signatures of each over time. And here I reach the point of nostalgia, the humbling fact of the endurance through the co operation, through the solidarity, of extraordinary people. 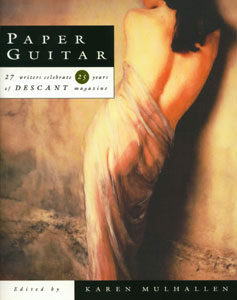 Descant magazine’s name comes from a poem by the great Irish poet, dramatist, mythographer, cultural critic, nationalist revolutionary, William Butler Years. The poem is called “After Long Silence,” and first appeared in a volume entitled Words for Music Perhaps. And so Yeats puts the point that song outlives our other passions and yet is fed by them, depends on them, exists because of them. The magazine has endured for a quarter of a century, our century, our chaotic, war-ridden, intense epoch. And it has changed with the changing currents of that epoch, naive I, who have edited it through that time. It began as a mimeographed gathering of single sheets stapled together. It began when ‘young / We loved each other and were ignorant.’ Those who began it have scattered, one is dead, some write still, others have drawn the curtains. But the glory of the enterprise is the glory of the descants which have grown immensely over the years, songs which could not be quelled. What tunes are sung by the voice as it descants? After I had asked each of the writers to join in celebration of the twenty five years of the magazine by creating a book. I eventually wrote to each and suggested a leitmotif of art, of the artist, of poesis in its widest sense. My suggestion was not to be prescriptive, but to perhaps stimulate an exchange around a common activity. The passage of time, the power of music, the origins of creativity, the hiding or the revealing of the truth, the revelations of travel, the discovery of the self, the discovery of the other, the weight of history, censorship, freedom, tyranny, and love. We are transformed by texts and by individuals. The text is an agent for change. Human beings change one another. Every writer in this book is an instrument of change. Every writer here has made me re-evaluate the meaning of text. Every writer here is working in the margins, on the frontiers. They will take you there, if you give yourself to them.